Many of the challenges associated with the management of the Paso del Norte watershed are due to its location along the border of the United States and Mexico and in parts of the states of Texas, New Mexico, and Chihuahua. The watershed extends approximately 340 miles along the Rio Grande/Río Bravo from Elephant Butte Reservoir in southern New Mexico to the confluence of the Rio Conchas in Presidio County, Texas (includes approximately 430 river miles). With an average rainfall of about 8 inches per year, the watershed receives its water from the Rio Grande and the Hueco, Mesilla, and Jornada aquifers. It irrigates approximately 200,000 acres of farmland and is impacted by the needs of over 2 million people living primarily in the cities of Las Cruces, New Mexico, El Paso, Texas, and Ciudad Juarez, Mexico. 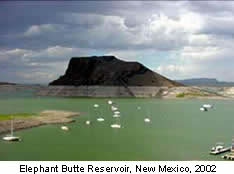 Other challenges in managing the watershed are related to the 1916 damming of the Rio Grande at Elephant Butte Reservoir in New Mexico to store spring Elephant Butte Reservoir runoff for use in irrigated agriculture and provide flood protection. This also altered river flows and essentially eliminated springtime flood pulses. Since that time, the Rio Grande has been straightened and channelized to deliver water more efficiently to irrigators and for flood protection. The floodplain-now contained between levees-is mowed annually for flood control. Releases of water from the upstream reservoirs only occur during the growing season, roughly March to October. As a result, the winter flows in the river consist mainly of return flows from agricultural drains and discharges from sewage treatment plants.The remaining aquatic habitat reflects the altered flows. "Estimated Benefits of IBWC Rio Grande Flood-Control Projects in the United States"